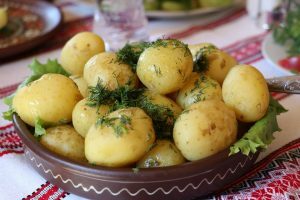 First early potatoes are a real treat - that melting, buttery texture; the lovely fresh taste - the surprise of the white potato from the brown earth ...... I could go on - but won't. Instead lets learn how to grow these early treasures. Earlies: Earlies or new potatoes have the quickest maturity time and are ready 15 - 16 weeks after planting. If you have a polytunnel or greenhouse then you can plant them in December or January and have very early potatoes on the table in March and April - depending on the weather. They have a lower yield than Maincrops and tend to be more on the waxy side. Maincrops: Maincrops take 18-20 weeks to mature after planting in mid-April onwards. Chitting is basically another word for sprouting. By getting the potato to sprout you have started off the growing process so that the plants will have a head start when you put them in the soil. In theory you will then get your potatoes a bit earlier. Is especially good with early potatoes. Potato sprouts, ready for planting. 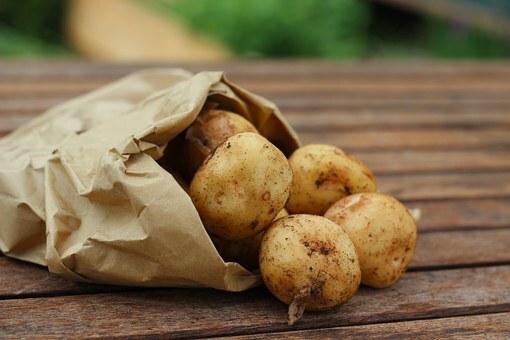 Potatoes will start chitting when exposed to light and heat, so place seed somewhere warm and light. A temperature of around 8C-10C is fine. Avoid locations that might get frost. Place the seed potatoes in a single layer with a large amount of eyes facing up. If you’ve only got a small amount of seed potatoes, recycling old egg boxes for this purpose is ideal. For larger amounts, use seed trays or wooden boxes. Keep the tubers upright by supporting them against each other. Once your seed potatoes have got 2-3 good sized ‘chits’ or sprouts on them (about 2cm), it’s time to plant. The sprouts should be small, knobbly, and green/purple in colour. If you end up with long, white coloured sprouts, it means there’s not enough light. Potatoes should be grown on deep, fertile soil that is well drained and contains plenty of organic matter. Choose a sunny position in the garden but avoid exposed sites and frost pockets, these delay the developing foliage. Potatoes need potash so dig in plenty of well rotted manure, compost and seaweed or approved organic potash fertilizer. Do not add lime - potatoes dislike lime and its presence in the soil appears to encourage scab. For very early earlies you will need to plant in a polytunnel or glasshouse. Dig trenches 8/12cms deep, putting the soil to one side. Place the potatoes in the trench with the shoots pointing upwards, cover with soil. Don't plant too deep as it is colder for the young plants. Plant Earlies 30cm apart in rows 40-50cm apart. You can also plant in largepots/containers or even rolled down compost sacks (make sure to put holes in first). These should be filled with good quality potting compost and a small amount of general purpose organic feed (such as Greenvale). Planting can commence as soon as the soil is warm enough - the end of March for earlies and April/May for later varieties. Planting distances are the same as above. When the shoots appear, use a draw/ridging hoe to pile up the soil over them (earthing up). The shoots should be just buried and a small ridge created on either side. This should be done about three times, or until the haulm (foliage) is too big to cover. Earthing up protects the tubers from frost and reduces the number of green potatoes. It also helps get rid of weeds. If using containers then top up with soil or compost as the shoots appear. Potatoes are sensitive to frost. So if frost is forecast you should either apply a little heat to your tunnel to keep it above zero, or cover your young plants with crop cover. Make sure to irrigate the plants as they grow - this is especially true if you are growing inside. To increase yield you can give the plants a potash rich liquid feed every two weeks - liquid seaweed, liquid Horsetail or Vinasse are very suitable for this and would be much appreciated. The wait is finally over! 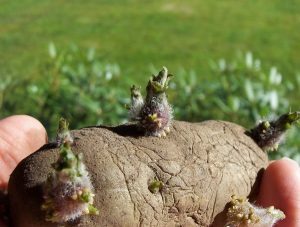 When the plants are looking mature and have been growing for between 80 and 100 days, have a look to see how the crop is doing - you should be ready to harvest some delicious early potatoes.